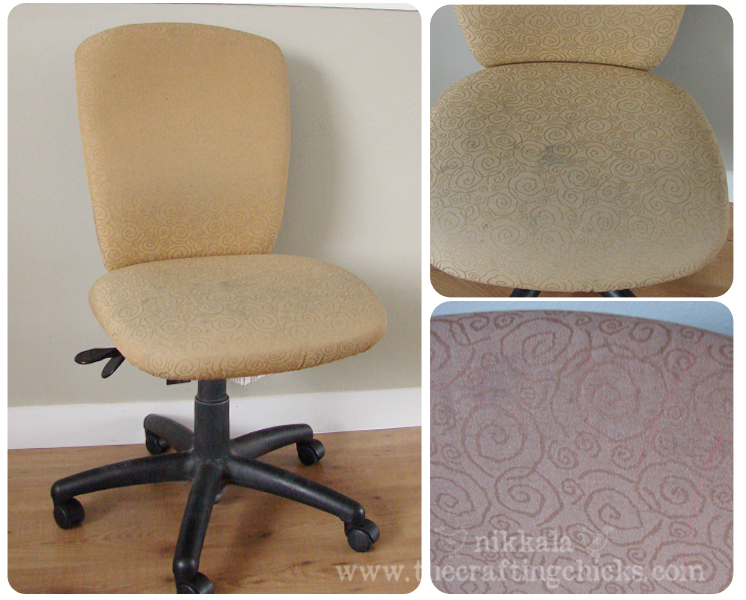 Our poor office chair went under the knife (and stapler–but no sewing!) to give it a new look. I picked this chair up for $15 a couple years ago when an office was updating their furniture. So it was a little worn when I brought it home, but add on a few years and it was plain nasty. Perfectly comfortable and in great working condition, just old and dirty. Instead of replacing it, I decided to give it a facelift. I’m sorry I’m even exposing you to these pictures but want you to see just how bad it was…the bottom right has pink highlighter drawn all over it and the then the dirty seat above. My 6 year old loves to spin around and around in this chair and I think what you see is the result of too many dirty shoes on the seat. When I found this duvet cover on sale ($17 for a queen duvet cover=a lot of fabric for not a lot of money!) I knew it would work for our “new” chair. The first step was to remove all of the old staples–and there were a lot! I flipped the chair over and using a screwdriver and pliers I started taking out the staples. Furniture factories are very liberal with their use of staples. It took a while to get them all removed. 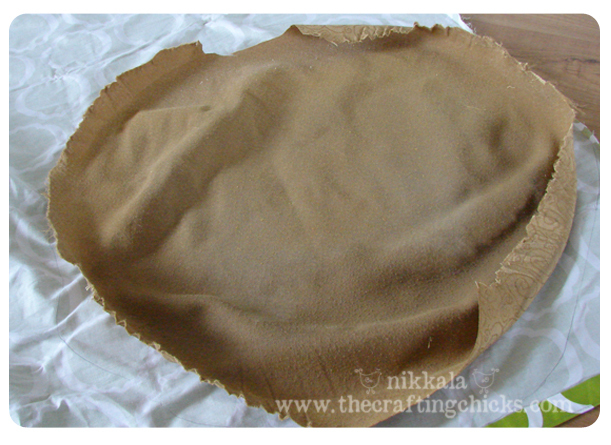 After all the staples were out I peeled the original fabric off to use as a pattern. The foam and the fabric were stuck together. My 3 year old asked why I was skinning our chair! I traced around the old one and cut out the new. 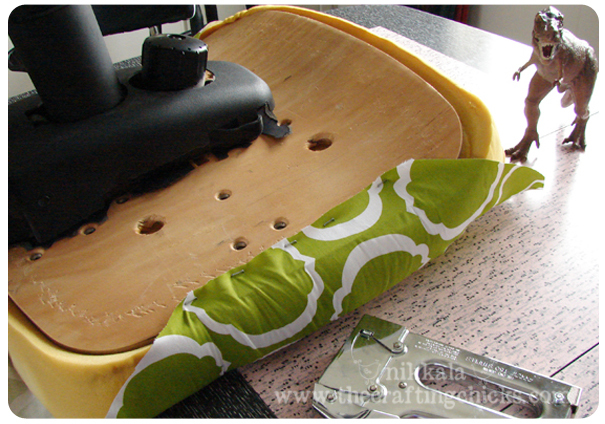 Tried it over the cushion to be sure it would be the right size before I started stapling. I should mention that the chair’s foam was still in good condition so I didn’t have to add or replace any of it. Then I did the reverse of the first step and started adding staples! The trick is to pull the fabric tight while stapling. It would have been nice to have another person helping, but never fear somehow T-Rex ended up right there cheering me on! I’m loving the results, but thinking I should ScotchGuard it just so I don’t have to do it all over again any sooner than I have to! This was my maiden furniture recovering experience, what about you–have you tried your hand at recovering furniture? I think it looks awesome! I’ve not tried to recover any furniture but I have an ugly old ottoman that’s really begging for it. I guess I’ll have to break down and actually do it! Love how this turned out. That green is one of my favorite colors too. Just beautiful! where did you find that duvet??? I need one for my screen porch bed!!! I so LOVE this fantastic creative idea!!! It looks so easy I think I could even do this. Oh my goodness, that looks great! I have an office chair that looks horrible but I didn’t know what to do with because the foam and chair are perfect aside from the gross fabric. Now I know what to do. 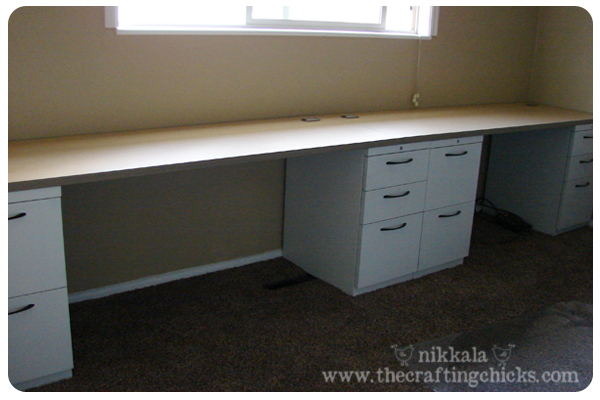 AND it will go into my craft room so I can make it as girly as I like. 🙂 Great deal on the duvet cover, I love finds like that! I just found you and this project from Pinterest, and I LOVE your chair! 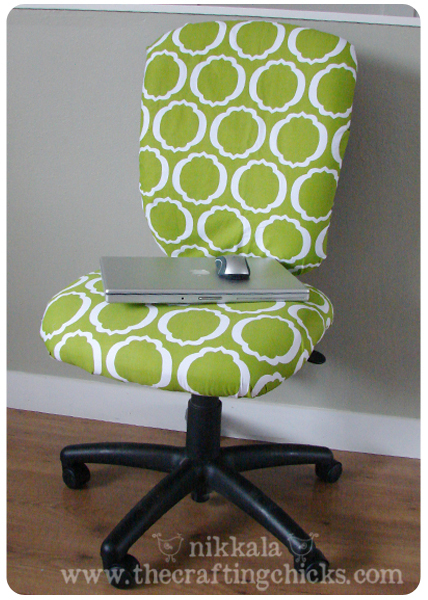 I’ve recovered chairs before, but I never considered an office chair makeover, what a great idea! I have an office chair that came with my house. It has to be from the 70’s but it’s got a big seat and arms and it is so comfortable I don’t want to get rid of it. It is just so ugly! You made this look so easy I just might try it. Thank you so much for this post. I’ve been complaining about my office chair for too long and I’m going out and getting a duvet cover tomorrow!!! Just so you know, you don’t have to use a duvet cover that’s just what I happened to find. Any fabric you like will work. Just be sure it is a high quality so it won’t rip! I love this!! Hobby Lobby always has remnants of upholstery fabric in their clearance section or you can catch it when it’s on sale 50% off!! Saw some cute stuff the other day but didn’t know what to do with it! Going to get it today to make over a yucky office chair! I absolutely love this. I will be doing this soon. I found this on pinterest!!!!!!!! Thanks for sharing. The chair looks great and comfortable. I’ll have to try this. I love the front of the chair and the bottom wouldn’t show but what about the back of the chair? How do you hide the staples? You can see the plastic chair back in one of the top photos that covers up the staples. I totally used your idea and ran with it. Thank you for the inspiration!!!! Great job! I have one of these chairs from a second had business furniture store. Not too dirty but a yucky shade of satiny blueish color. Hard to describe color along with that odd embossed print they put on that kind of stuff. My husband is not happy that I found this website! But I’m getting all kind of ideas! He did like this one though. His office chair is pretty nasty looking, but is still in otherwise good condition. So…. Can you use regular upholstery fabric instead of a duvet cover? I think not only you certainly CAN, but also it will last a lot more than a thin (or even a thick) duvet cover fabric. I have yet to do my office chair, which is begging for it, but I’ll use some good, thick fabric. My poor office chair has to endure a lot! LOVE it!!!! Fantastic instructions and very inspirational! Love it! If you were to use regular fabric, about how much do you think it would take? 2 yards, or more? 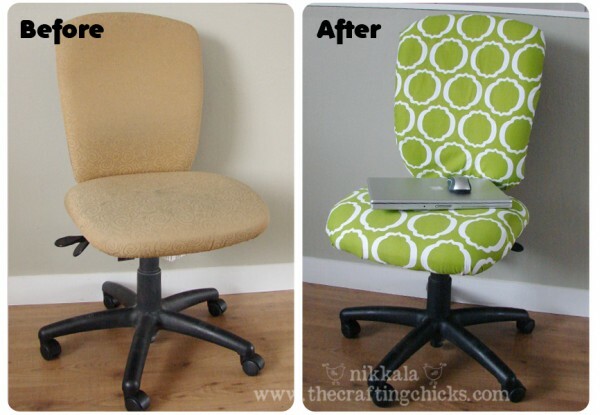 This is awesome – I never would have thought of giving new life to an office chair. Gonna hit the thrift stores tomorrow looking for one to transform! Absolutely LOVE this!!! Any suggestions for one of those office chairs with a black mesh back… we leave in a VERY hot climate, and my hubby loves the idea of the mesh back, but I want to spice it up! I was thinking the same thing! I’m considering fabric spray paint for the mesh back! I’ve never tried it, but, hey! What’s the worst that could happen?? Looks great, I am totally going to recover my chair!! this only works when there is a wooden base. If you have a chair with a metal base, you cannot staple the covering one! If you can sew you could take a couple of yards of fabric, cut pieces a few inches bigger. 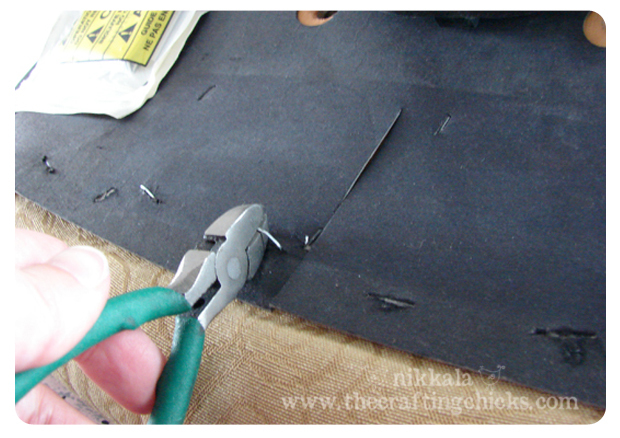 Then fold down and pin casings slightly wider than the elastic you will be using. Sew it, thread it, sew the elastic and last, the opening in the casing. Slip it onto the seat and the back! That’s how I did mine. I love this idea. I use the bottom seat part of the office chairs my children have broken. This way I can roll around my classroom when I am working with a group of students. I definitely will be doing this the purple chair I just added to my room. It is full of stains also and is in need of a make over. I can’t wait to go look for some fabric. Do you suggest any particular type of fabric? This is the best remake of an old basic desk chair I have seen. I have often wondered how to do this but it looks fairly easy. 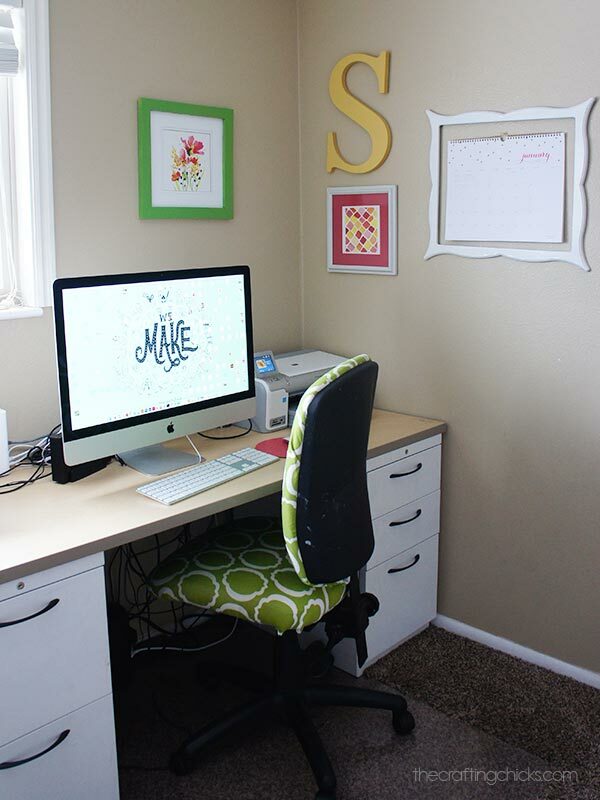 I will do this for my teens remodel of her study room. I have dining room chairs that were off white (children!) I was planning on redoing them myself but was some what apprehensive! Not anymore! Thank you for the step by step! Hey! Fantastic. 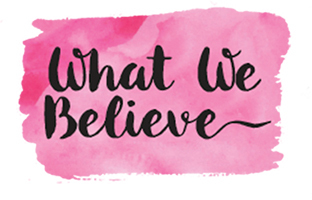 I would love to re-post this to my blog with full credits and linkage when it is up and running (I currently am here, but am changing my site . I reupholster furniture among a million different craft/art things and totally wee’d my pants when I saw this. Took under 30 mins. So happy, I hated my chair, have another to do but need to get a stronger staple gun first. Genius project, thankyou! woops. forgot to show you my site, it has rude words (warning!) but is good fun. Check it out. Eventually I will close this and open a bigger better one, but it gives you an idea of what I do. I love that green print! I reupholstered an office chair yesterday, although the shape is much different. Thank you for posting this. I am so going to do this to our chair. Your chair looks amazing! Love the fabric!!!! Nice job. 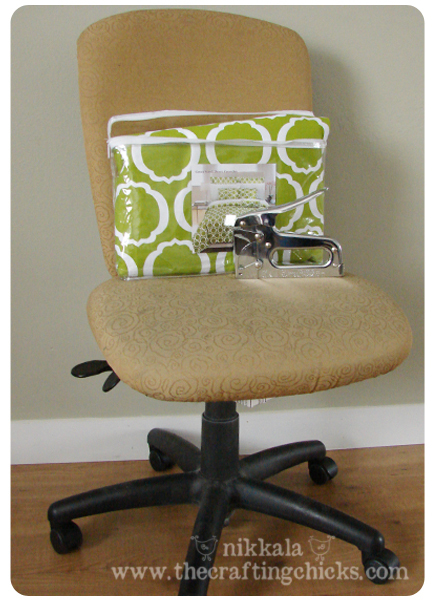 I’m inspired to recove my sewing studio chair and start looking for a second chair to add for students. I was looking at my current chair and I think they used a spray adhesive between the fabric and foam cushion. I think that is what keeps the fabric from rolling and wrinkling when you sit on it. I found a great blue and gold upholstery fabric at a yard sale for $1. I think it is about 3 yards. BARGIN! Love knowing there are other out there who enjoy DYI. I’m actually trying a very similar project right now & that’s how I found this post:) Thanks! Was the back of the chair a challenge? Are there any pics of the back? My concern is taking the back off the chair and redoing it. You didn’t show pics of how it was done. Love the chair, and what a great idea as I look at this tacky ancient chair in my sewing room. BTW, I have three dinoes sitting here on my table in my sewing room. Good on ya! Looks great. I just covered a desk chair for my friend and it came out amazing. This is the second time I have done this. 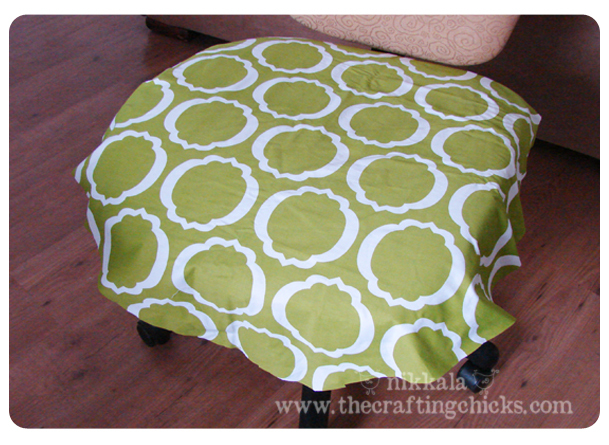 I used an expensive fabric that had been discontinued at a designer show room so it was free! These styles of chairs are fairly easy to take apart and reupholster. My desk chair in my craft room is another story a little more complicated. I’m hoping I can find a site to help me out. Doesn’t a little fun colored and patterned fabric make a world of difference? Wow!!!! There is a big difference between before & after chair. I like your idea so much. 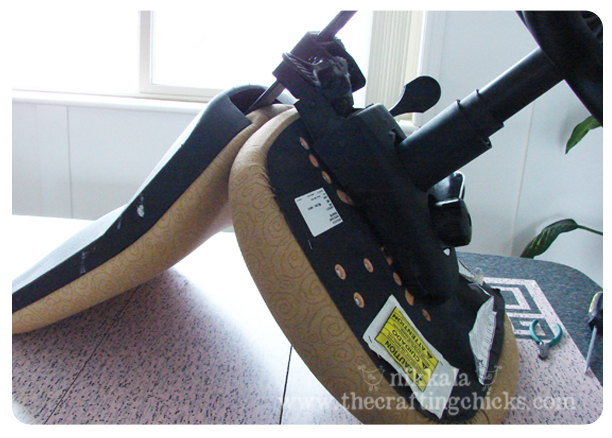 I think after reading this post, everyone will try this simple idea to remodel their chair. How do you get the back of the chair to pop out of its plastic back? Looks great, BTW.